My seventh and final journal entry to be posted online is uplodaded (click here to view the .pdf) and it definitely demonstrates how obsessed I am with sewing this year. As July grows closer I'm bubbling over with ideas on what to do during my for-fun sewing month. I also hang onto my patience for the delivery of Anne Frasier's newest release, The Body Reader, confess to my secret affection for squirrels and talk a little about what this experience has been like for me. I'll have a lot more to say about that when I don't have to post online what I write in my journal. It won't be negative. It's true that I am a pretty private person, and it's always a challenge for me to open up to anyone outside my immediate family. That said, this was a positive experience, and not just because of the absence of spitting pinheads. I went through a brief but pretty ugly crisis, and kept my cool. I came up with some fun ideas for my summer projects. I celebrated very ordinary things that are special to me. My journal is the paper version of the everday me, sloppy hand writing, silly sketches and spelling mistakes included. I don't have to be the pro writer or PBW or anyone else in my journals. You can't believe how relaxing that is when you have that for yourself. I know I won't convince everyone to start journaling, but I hope some of you will give it a go. 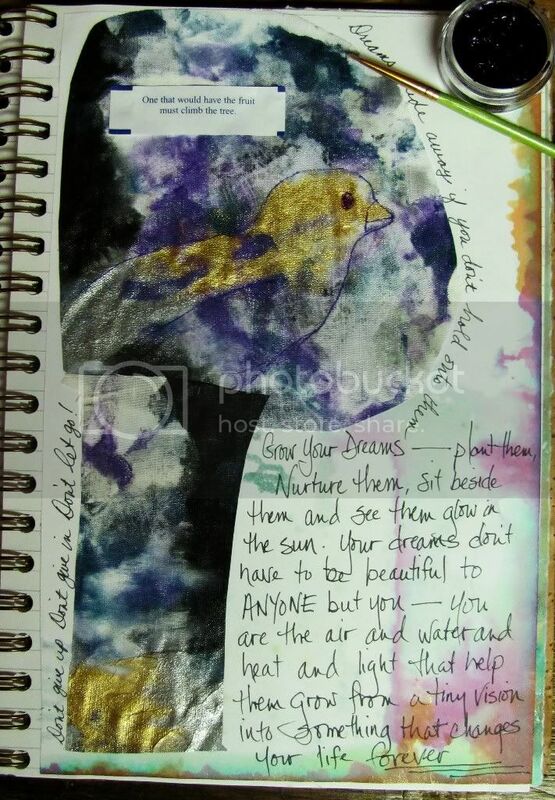 No matter where you are in your life, a journal can be a companion to your experiences. It can preserve some of who you are for future generations. It can be your secret art studio, idea library, and writing work desk. Or it can be a place where you can sort out your feelings, focus on things that enrich you, and dispense with what you don't need in your heart or your life. Your journal can be whatever you like, and that's the real beauty of journaling. You tailor it to whatever works for you. Your list for 'fun' sewing looks like mine. You will be glued to the sewing machine if you want to make it through that list. What fun ideas. I have a cosplay outfit to complete in the next couple of weeks. And some journal covers to make...and... Well, I won't go into my list!